22 year old violinist is not sure he will be well enough to participate in his rehearsals and two performances of two 15-minute programs, due to symptoms. - Train to move from hip joints, not neck or back, for bending forward while sitting and standing. - Identify all the alignments and movements that increase symptoms, and try to eliminate them. - Alter alignment and movements as soon as symptoms come on, in order to diminish them. - Use a timer when using computer to take measured breaks. On the break, do the arm raise exercise and/or head retractions to reverse the effects of poor posture. 1. I can tell for sure that my tendency to elevate my left shoulder has aligned my upper body in a way that causes temporary pain in neck and left arm. 2. I think exercises - especially doing frequent head retraction - had a lot to do with my improvement. I realized now I tend to play in a more neutral position, with chin barely touching the chinrest. 3. Taking a break more often while practicing/rehearsing seems important. Now I take a break every half an hour." "Now I can say with assurance that these symptoms were results of sustaining body positions that are not neutral, for they gradually disappeared as I worked with you on neutralizing my neck and arm positions. When I first experienced left arm discomfort was when the intensity was highest, probably 6~7 out of 10. 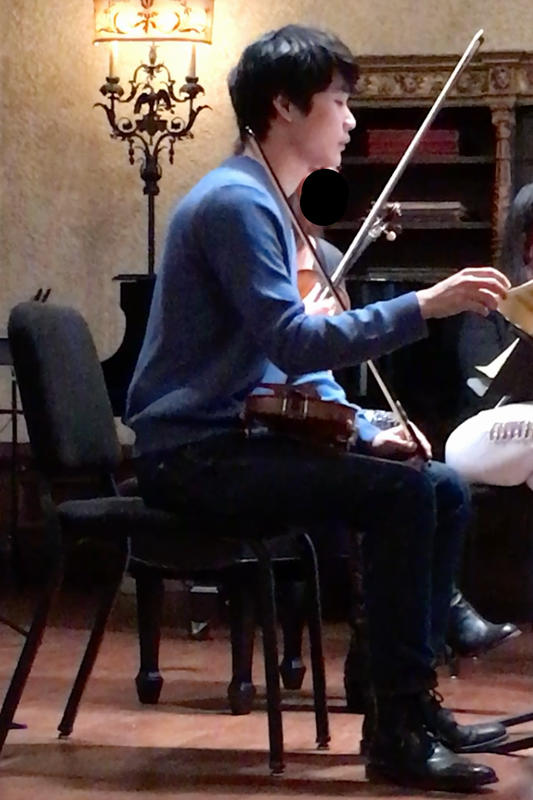 During rehearsals in Caramoor, the symptoms relieved, maybe to 3~4." "1. The headache only lasted for a day or two when I first felt the symptoms. I think I was so frightened at first and that the headache had to do more with some psychological fear....? 2. My doctor's diagnosis was migraine (which happens without headache) and neck seizure: he thought migraine was more probable, as neck seizure rarely occurs to someone in my age. I think my arm is fully recovered now. I will update you whenever discomfort reoccurs."